If you’re still looking for something to do this weekend (besides stocking up on bread, milk, and toilet paper before the apocalyptic storm being predicted as I post this), you can find the October program preview here to refresh your memory. I’ve included a few items below that didn’t make it into the earlier list, but the bulk of it belongs to November. Most sites will be closed for Veterans Day on Nov. 11 and also on Nov. 12 (either because they’re normally closed on Mondays or because of an adjusted holiday schedule). All sites will be closed on Thanksgiving, but some will be open the following day. I’ve indicated below which sites are open, but it’s always best to check ahead to make absolutely sure, as plans can change. Oct. 28: Remember Johnny Mitchell Day—this annual event commemorates the United Mine Workers President who led the anthracite strike of 1902. This year’s program includes historic film footage of anthracite mining along with commentary by Atty. F. Charles Petrillo and Dr. Philip Mosley. (More info on Facebook here.) 2 pm. Nov. 24: Patriot’s Day—British and Continental troops, civilian reenactors, sutlers, and much more at this annual event commemorating the Battle of Brandywine and its significance to the American Revolution. There will be a special Saturday edition of Battlefield Movies, featuring The Patriot. 9 am-4 pm (movie at 1 pm). Nov. 25: Battlefield Movies—April Morning, a 1988 Hallmark Hall of Fame production about the Battle of Lexington and Concord, based on the 1961 novel by Howard Fast. 1 pm. Nov. 4: Open noon-4 pm. Nov. 17: Candlelight Tours—this annual program features living history, 18th-century music, and a chance to see the site by night. 6-8:30 pm. Nov. 13: Friends Lecture Series—“Architecture of the Cornwall Area,” with speaker Bryan Van Sweden of PHMC’s Bureau for Historic Preservation. Van Sweden’s lecture will include a demonstration of “reading” clues in the architecture of old buildings. Lectures are held in the auditorium of Freeman Hall at Cornwall Manor retirement community. 7 pm. Nov. 3: Daniel Boone Birthday Celebration—“meet” Daniel Boone, in the person of historian and interpreter Scott New from Fort Boonesborough, Kentucky. There will be lots of activities going on (go here for details). The Friends of DBH are holding a fundraising dinner that evening (deadline for reservations is Oct. 27 so call now). 10 am-4 pm; Scott New will present his Boone program at 11 am and 2 pm; dinner is at 7 pm. Nov. 11: Fall Lecture Series—today’s program is presented by the Daniel Boone Spinner’s Guild; check the website for details. 2 pm. Nov. 18: Fall Lecture Series—Les Rohrback from the Berks County Association for Graveyard Preservation is the guest speaker. 2 pm. Ongoing: Fall Foliage Photo Contest—pay a one-time fee of $5 for access to the site and enter your best autumn photo. Deadline is Dec. 3 (go here for info and entry form). Nov. 11: Fall Lecture—presented by the Greater Hazleton Area Polonaise Society, celebrating Polish American heritage. 2-4 pm. PROGRAM WILL BE RESCHEDULED FOR SPRING 2013. Nov. 1 and 8: Tickets for Christmas at the Cloister—dates for the program are Dec. 10 and 11, but tickets go on sale in November. Members of Ephrata Cloister Associates can purchase tickets in the museum store or postmark their mail order starting Nov. 1. The general public can begin purchasing (in person or by mail) on Nov. 8. Go here for details. Nov. 3: Cover Day—the Niagara crew will begin making the ship ready for the winter. Visit the museum website for more info as the day gets closer. Nov. 18: Lecture—noted Battle of Lake Erie scholar Gerry Altoff will be the featured speaker in Hirt Auditorium at the Museum. Altoff, who retired as Chief Ranger and Historian at Perry’s Victory and International Peace Monument (NPS) in 2004, has written extensively about the War of 1812 on Lake Erie and speaks before a wide range of groups (the day before this lecture he’ll be speaking at a conference on Shipwrecks and Scuba (additional bio here)—have I mentioned how much I love Google?). 2 pm. Nov. 11, 12, 23: Open 10 am-5 pm. Nov. 3: Paranormal Investigations—the program will explore various spaces on the site; registration fee ($50) includes snacks and beverage service). Call 215/915-9453 for more info or reservations. 6:30 pm-1 am. Nov. 24: A Soldier’s Christmas—see how soldiers have celebrated the holidays on the battlefront of different eras. Free admission; food and crafts available for sale (more info here). 3-8 pm. Nov. 3-4: Whitemarsh Encampment Re-enactment—this long-standing event commemorates the Nov. 2-Dec. 11, 1777, encampment of Gen. George Washington and the Continental Army in the Whitemarsh Hills. Go here for program details and to download a discount coupon. 10 am-4 pm. Nov. 4: Heritage Day—costumed interpreters will be stationed in the house as you tour, Dr. Priestley will demonstrate chemical principles, and there will be games for children. 1-4 pm (chemistry demos at 1:30 and 2:30). Nov. 11: Open 1-4 pm. Nov. 3-4: Weathervane Holiday Open House—shop for locally handmade art, crafts and heirloom-quality gifts and enjoy holiday decorations in the museum store. 9 am-5 pm. Nov. 4: The Legacy of the Long Rifle—in conjunction with the museum’s Lancaster Long Rifle exhibit, this program presents several speakers on different aspects of the rifle’s history. “Daniel Boone” (Scott New, see program listings for Daniel Boone Homestead above) will talk about the Lancaster Long Rifle’s spread westward; John Kolar (one of the guest curators of the exhibit) will talk about the accuracy of the Pennsylvania Rifle; and Dr. Scott Stephenson will talk about the Pennsylvania Rifle in the American Revolution. For more info go here. Noon-5 pm. Nov. 8: Hands-on History Days—experience seasonal chores, a one-room schoolhouse, hands-on crafts, and wagon rides. $10 per person (ages 5 and under are free). 10 am-3 pm. Nov. 10: Trades Workshops—this year, choose between learning to make a lantern like the ones used during evening programs on the grounds or learning to spin and knit. Go here for details. 10 am-4 pm. Nov. 23: Open 10 am-5 pm. Nov. 25: Annual Christmas Dinner—enjoy a lantern-lit evening in the historic Feast Hall and help support the educational programs of Old Economy Village. More details are here. Deadline for reservations is Nov. 18. Nov. 18: Open Hearth Cooking—the cooks will be exploring German food traditions (William Penn invited residents of the Palatinate to settle in Pennsylvania) and comparing them to English traditions of the period. 1-4 pm. Nov. 7: Friends Lecture Series, "Operation New Dawn - Civilian/Military Cooperation in Iraq, 2010-2011"—retired Foreign Service Officer Martin Quinn will discuss the changeover from military to civilian management of State Department responsibilities during his service in Iraq. 7:30 pm. Nov. 10: Kids Day - Dress Up and Discover! !—Kids of all ages get to try on field gear and head gear from the museum education collection. Photo ops abound with three backdrops in the museum theatre. Visit the education stations in the galleries for more fun discoveries throughout the day. Half-price admission for ages 3 to 13; a donation is requested for the Dress-Up station. Parents must remain on-site while their kids participate in the activities. 10 am-3 pm. Nov. 11: Open noon-4 pm. Nov. 13: Central PA Civil War Roundtable Lecture, "The Battle of Shiloh, Tennessee"—speaker Matthew Atkinson discusses the bloodiest contest (April 6-7, 1862) in American history up to that time, in which Union Generals Grant and Buell beat back the surprise attack of Confederate forces led by Generals Albert Johnston and P.G.T. Beauregard. 7:30 pm. Nov. 23: Open 10 am-4 pm. Nov. 3-4: Trains & Troops—this annual program salutes our armed forces and explores the role of the military in railroad history (and vice versa). A Swing Dance Saturday night (separate ticket) lets you enjoy big band music, refreshments, and swing, swing, swing. Go here for program details and schedule. Sat., 9 am-5 pm; Sun., noon-5 pm. Nov. 11: Open noon-5 pm. Nov. 23: Open 9 am-5 pm. Nov. 2-Feb. 13: Pennsylvania Watercolor Society exhibit—The State Museum is hosting PAWCS’s 33rd Annual International Juried Exhibition, with 120 watercolors selected from some 600 entries. Opening reception Nov. 4, 2-4 pm. Nov. 3: “Contact, Conflict, and Colonization: The Archaeology of Penn’s Woods”—this is a day-long workshop exploring European colonization from 1550-1783. Go here for more details. 8:30 am-6 pm. Nov. 16: Hidden Treasures Scavenger Hunt—it’s 3rd in the Burg and grown-ups get to explore the museum at this “friend-raiser/fundraiser.” Adult beverages, heavy hors d’oeuvres, and music by Back Alley Blues. For details go here. 6-9 pm. Nov. 11: Open 10 am-4 pm. I’ve found myself with several items in my “pending for Trailheads” folder that finally seem to have coalesced into a weekly post. At the very least I think they amount to a collection of interesting people who are all connected to the Trails of History directly or indirectly. So here goes. 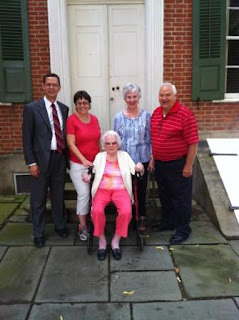 Back in August, 107-year-old Lucille Severine toured Old Economy Village, enjoying the gardens, the George Rapp House, and the recreated Harmonist Museum. Everyone’s reasonably sure that Mrs. Severine is the oldest person ever to tour the site. (She was in her early teens when Old Economy became Pennsylvania’s first state-owned historic site in 1919.) We should all be so lucky to still be visiting new places at 107. Her connection to the Trails of History? Her grandson Michael Knecht is the site administrator at Old Economy. The Sept. 30 edition of the Lancaster Sunday News included two articles about Trails of History denizens. Mary Ellen Wright’s “In the Spotlight” feature focused on Michael Showalter, museum educator at Ephrata Cloister since 1996 (he’s been with PHMC for 25 years). Asked to describe the best part of being a museum educator, Michael noted that, “I enjoy being able to use my knowledge and creativity to bring history to life for everyone, regardless of age or background.” Anyone who’s seen Michael at work will appreciate the truth of that. (You can read the entire piece here.) There may still be tickets available for tomorrow night's "Mysterious, Melancholy, and Macabre" tours; call 717/733-6600 for reservations. 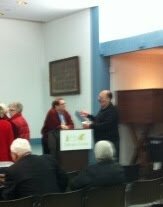 My apologies for the lousy image quality, but I remembered that I had a photo of Michael (on the left in the photo below) and Tom discussing Pennsylvania German food traditions during a break at Ephrata’s Winter History class in February of this year (blog post about the class here). Most of what we do here on Trailheads is to shine a spotlight on the work going on out there on the Trails of History. This week, I’m happy to report that some other organizations have recognized that work as well. Congratulations to The Weathervane Museum Store at Landis Valley Village and Farm Museum. The store was recently named one of four national honorable mentions for Smart Retailer’s Retailer of the Year Award. In an article profiling the honorees (you can read it here), author Lynn Petrak describes the store’s mix of wares by local artisans, sold primarily on consignment, as an important element in supporting the area economy and providing visitors with unique souvenirs of their visit to Lancaster County. Kudos to manager Mary Parelli, the Landis Valley Associates, and everyone else who makes the Weathervane a success. Last week, the Pennsylvania Downtown Center (PDC) announced the recipients of the 2012 Townie Awards, recognizing “the commonwealth's core communities and individuals for creation and implementation of projects, programs and events that exemplify the goals of PDC's community revitalization mission.” United Neighborhood Centers of NEPA (northeast Pennsylvania) was honored in the category of special or neighborhood event for the Arts on Fire Festival, which takes place at the Scranton Iron Furnaces. Specifically, Arts on Fire is part of UNCNEPA’s Elm Street Project, a community revitalization initiative on Scranton’s South Side that has partnered with the Furnaces and the Anthracite Heritage Museum (AHM) to focus on the historic site as an important asset to the area and a gateway from downtown Scranton to the South Side. Congratulations to Elm Street Manager Jill Murrin (former PA Conservation Corps crew leader at AHM), site administrator Chester Kulesa, and the many, many folks who have worked to develop this program and the partnership that supports it. Have You Hugged an Archivist Today? With their permission, of course. My apologies to my colleagues at the Pennsylvania State Archives for failing to mention in last week’s post that October is Pennsylvania Archives Month. This year’s poster (below) supports the 2012 theme, “The Land of Penn and Plenty: Bringing History to the Table,” and features archival photos from the Department of Agriculture and the Department of Commerce (proving that Pennsylvania has been marketing its food heritage for years). Archives Month is a national effort to draw attention to the importance of documentary heritage—not just the keeping of it but also the sharing of it. The Mid-Atlantic Regional Archives Conference (MARAC) has a statement on their website about the importance of archives to lifelong learning—from students doing History Day projects to seniors researching their family history to pass it along to the next generation. Our historic sites and museums use archival research to make connections between the artifacts in our collections and the stories they have to tell. For sites dealing with the 19th, 20th, or 21st century, historic photographs can illuminate topics in striking ways. You can search the Trailheads blog archive for “archives” and find quite a few relevant posts. Go here, here, or here for a few of them from the past year. How have you used archival research lately?